Detractors often knock St. Clair West for its visual clumsiness, relative to the showy flair of the other Spadina-line subway stops. This dismissive attitude is superficially understandable, but glosses over some critical background nuance: the station (along with Wilson) is the admittedly-contentious capstone achievement of the TTC’s Herta Freyberg, the woman whose impactful 30+ year career at the Commission helped shape the look and feel of Toronto’s subway stations. For that reason alone, I urge you to reconsider this station’s architectural significance—if not necessarily its aesthetic appeal. I know what you’re thinking. Who the heck is Herta Freyberg!? I’m glad you asked. Freyberg was a key—albeit heretofore unsung—TTC architect, following the more famous trio of John B. Parkin, Alvan ‘Shy’ Mathers, and Arthur Keith (the first two were retained as external architects, while Keith, Freyberg’s longtime boss and predecessor, was a TTC employee). One day a Miss Freyberg came in to see me. [...] She had received her training in Czechoslovakia. She showed me some samples of her work. I was impressed with her work and her as a person. She was employed. I got some flack from my staff about hiring a woman! At that time I was trying to determine the best office procedure to design stations. [...] In her first two weeks Miss Freyberg spotted a structural error in one of the designs and sent it back for correction. This bit of news flew through the whole department. The structural design men were embarrassed and apologetic. Herta was welcomed into the club, and gained the respect of all of us. She went on to do good design work under John Parkin and Art Keith, and finally took over full responsibility for the architectural design section, and later the St. Clair Station of the Spadina Line. Over the years I have seen many stations in Europe, U.S.A., Canada, Mexico, South America, Japan and China and nowhere have I seen as good an example of intermodal transfer design as in that station. If there is a better one, it has been built since I retired. Freyberg’s complex layout, necessitated by the situational geography of the Nordheimer ravine, as well as by the requirement for integrated bus and streetcar platforms, has, in the present day, challenged efforts to make the station accessible. Four decades later, it’s easy to criticize. But at the time of its construction, St. Clair West represented state-of-the-art, internationally-informed thinking in terms of efficient passenger flow betwixt multiple transit modes. Her expansive design immediately stirred up controversy—neighbourhood residents and the local alderman vigorously challenged the location and placement of the lengthy streetcar ramps and various exits, forcing several alternate proposals to be presented—but the TTC overrode the objections, and more or less went ahead with Freyberg’s original vision. Due to lower ridership north of the station, and to provide more frequent service to the south, half of the northbound trains during the morning rush hour are short-turned at St. Clair West. This long-familiar practice may change when the TYSSE line begins service. Like all the Spadina line stations when they opened, St. Clair West features prominent artwork on display. Gordon Rayner’s abstract mural Tempo stuns bleary-eyed commuters into submission, with its dazzlingly bright enamel colours and angles. Try to avert your eyes if you’re hung over! The station is also distinguished by its bar-code decorative tiling, and by the energetic, orange-lit panels at the south end of the subway platform. As part of the Easier Access station upgrade project, the central concourse staircase walls at St. Clair West will eventually incorporate a new public art installation by Rhonda Weppler and Trevor Mahovsky, called The Commuters, consisting of thirty to forty bronze snails mounted in different spots. The opening ceremonies for the Spadina line were held at St. Clair West on January 27, 1978, with Ontario Premier William Davis presiding—you can find the commemorative plaque for the line on the mezzanine level. I’m not arguing that St. Clair West is a fantastic perfection. It has numerous flaws and oddities (though the useless elevator at the Heath St. entrance can’t be blamed on Freyberg; that was a subsequent add-on. And the bare ‘rock gardens’ are a grating reminder of TTC neglect or indifference.). What I’m suggesting is, Freyberg’s quiet but pervasive contributing imprint on TTC stations built in the 60s and 70s elevates the historical significance of St. Clair West. 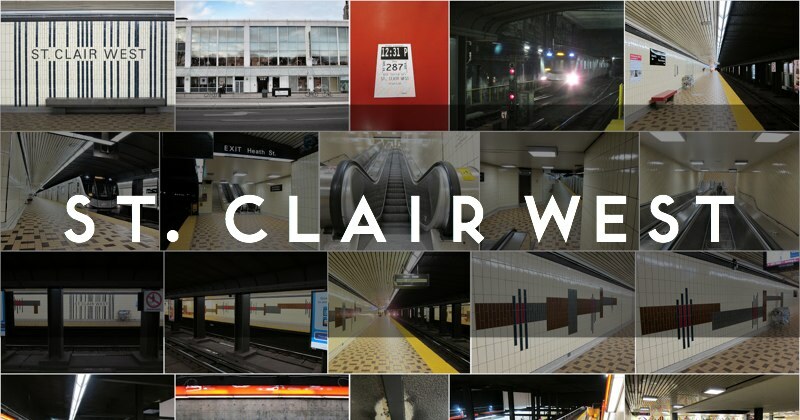 Whether you like the station or not, St. Clair West embodies her characteristic ‘TTC functional’ brand of architecture, and therefore demands re-interpretation—and even wry appreciation. 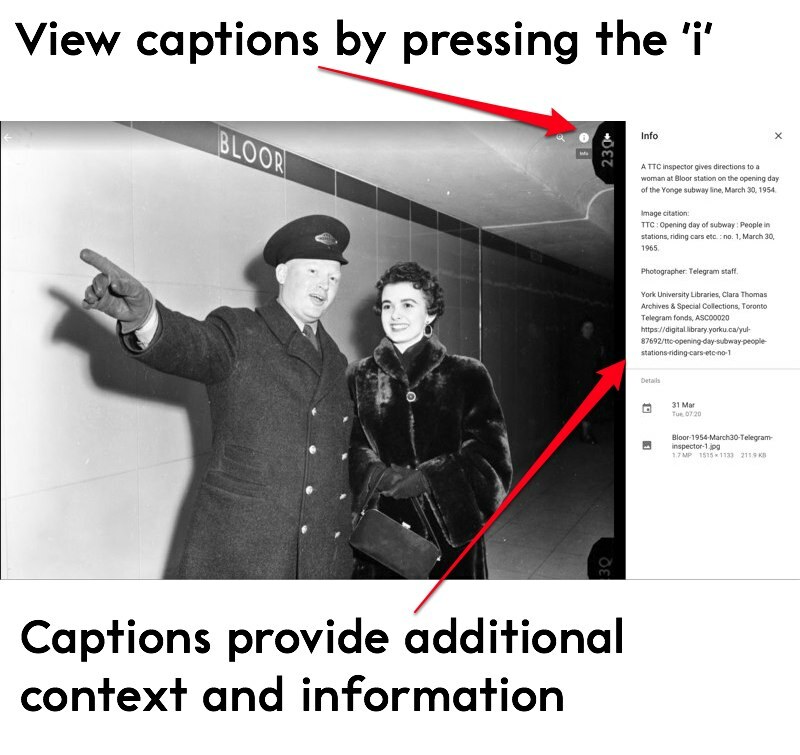 This post is dedicated to Herta Freyberg [in case you hadn’t noticed!]. In the traditionally male-dominated, boys-club world of the post-50’s TTC management ranks, Freyberg was one of the most senior-level, substantive women employed at the Commission for many years. Leafing through archival issues of The Coupler (the TTC’s internal magazine), one can readily chart her rise, from an initial posting as an architectural draftsman in 1948, to an appointment onto the modestly-named but influential Subway Sign Committee, and upwards through several successive promotions, eventually culminating in her leadership of the TTC’s Architectural section. 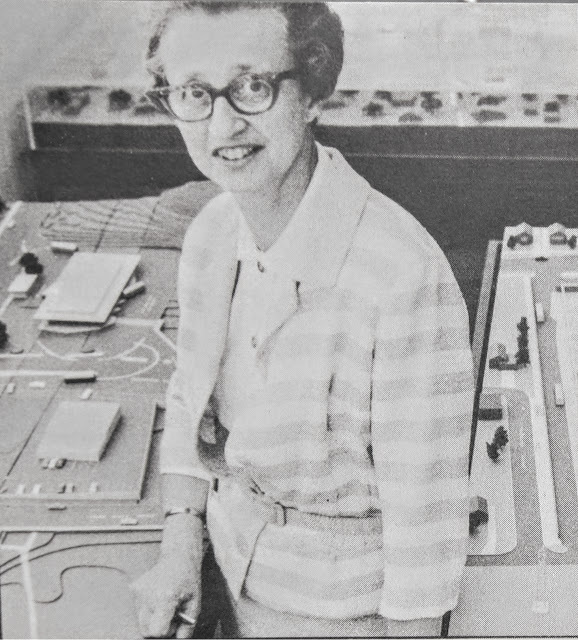 Herta Freyberg, shown here in 1971 posing in front of a model of Finch Station. Here’s to you, Herta, and to all the other unheralded architects on your team!